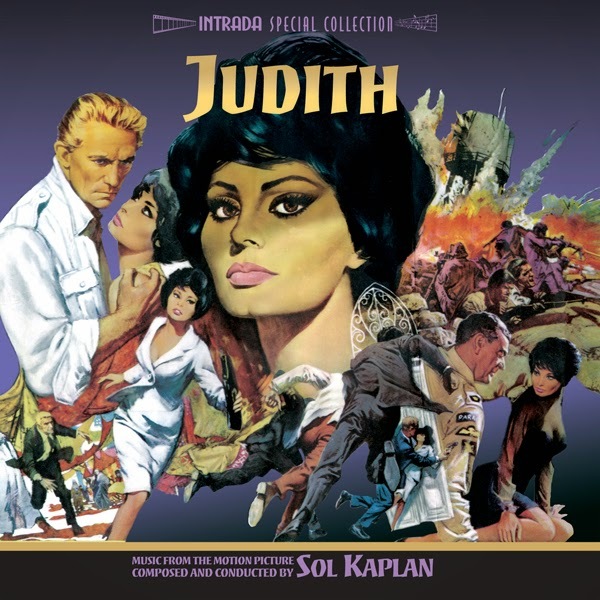 The 1965 Paramount film Judith gave composer Sol Kaplan a rare opportunity to score a big-budget epic. The Spy Who Came in From the Cold, scored the same year and released recently by Intrada, was an espionage thriller who's chilly realism had called for a spare, bleakly moody score. In striking contrast, Judith’s bold melodrama required something big, which Kaplan handily provided. His robust score, performed by the Sinfonia of London, features two primary themes: a powerful, anthem-like theme for Judith, and a hora—a traditional Israeli folk dance— for the kibbutz and its people. RCA Victor released a re-recorded LP album of Judith featuring 38 minutes of music, a fairly generous presentation for the period (sourced here from ¼″ stereo tape album masters and presented on disc two). But Kaplan recorded well over an hour of music for the film and this Intrada presentation of the score (courtesy ¼″ mono tapes from the Kaplan Collection at the University of Wyoming and featured on disc 1) reveals the composition’s full scope and variety for the first time. Judith centers on events leading up to the partitioning of Palestine and the formation of the State of Israel during 1947 and 1948. Sophia Loren plays concentration camp survivor Judith Auerbach, who is smuggled into Palestine by the Haganah, the Israeli underground army, to help identify her former husband, Gustav Schiller (Hans Verner). Schiller betrayed Judith and her son to the Nazis to cement his position in the Party during the war. Now, the Haganah suspects he is training Arab tank commanders in Syria for an attack that will take place when the protective British Army forces withdraw. The fiery Judith takes the assignment, but she really intends to kill Schiller for causing the death of her son.